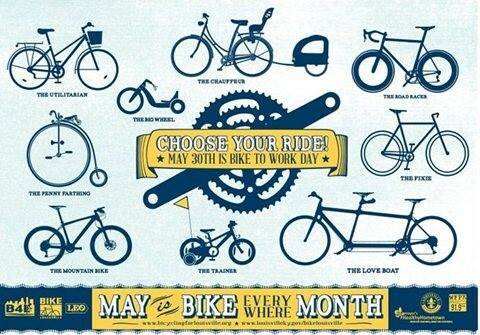 Join us for Kentuckiana’s official Bike to Work Day on May 30th. Along with rides at Seneca, Tyler, Shawnee, and Iroquois Parks, we will be meeting up at the base of the Big Four Bridge on the Indiana side at 7:30am for a ride into downtown Louisville. This short 3 mile bike ride will show you just how easy it is. Biking to work on the Big Four Bridge gives you unprecedented safe access to downtown Louisville. Not only is biking to work fun, it is a great way to stay in shape and save on parking and gas! After the work day, we will meet up again at 4th Street Live at 5:00pm for a return trip back to Jeffersonville. The day will end with Bike to Work Happy Hour at Jeffersonville’s newly opened microbrew, the Red Yeti. If you have specific questions, please contact your ride captain at mike_sewell@gspnet.com.